It seems reasonable to believe that the Obama administration and the Congressional Budget Office may have taken advantage of the way the failed attempt by labor unions and leftists to oust Wisconsin governor Scott Walker dominated the political news cycle earlier this week. 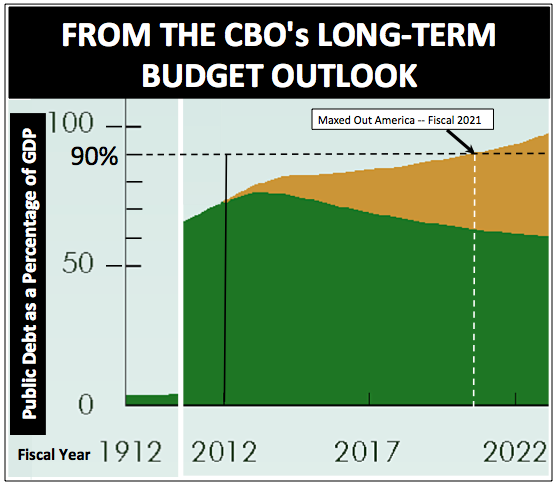 On Tuesday, the CBO released the 2012 version of its long-term federal budget outlook. Somehow, the pencil pushers and spreadsheet generators got this year's rendition done 17 days earlier than last year's. How convenient. How bad is the outlook? As James Pethokoukis and others noted, it's so frighteningly bad that the CBO couldn't project its worst-case scenario on the economic impact of the national debt. According to Page 38 in the full report, "Debt would reach 250 percent of GDP (gross domestic product) by 2035 under the assumptions leading to these estimates. CBO’s model cannot reliably estimate output after debt reaches that amount, in the agency’s judgment." That's because, as the Wall Street Journal noted and quoted, "so much debt is so far outside 'historical experience' and the CBO's 'assumptions might no longer be valid.'" Expressed in layman's terms: Such a stratospheric level of debt breaks the model, because we'd be going where no country has gone before without experiencing financial collapse. Shorter-term, the CBO report's "Extended Alternative Fiscal Scenario" projects that the federal government will hit what many economists consider the danger-zone level of debt -- namely the point at which debt held by the public (excluding intergovernmental holdings) reaches 90% of GDP -- sometime during fiscal 2021, the same year as its 2011 projection. That 90% threshold is what I characterized in a column last year as when the country will become "Maxed Out America," reaching the point where the federal government will likely either have a hard time issuing additional debt, or will have to start paying higher than risk-free rates to do so, starting a vicious cycle which will be hard to stop once started. I believe that the CBO is being unjustifiably overoptimistic. Even if Barack Obama is not reelected, its assumptions about how the economy will perform in the near term seem too rosy. If Obama is reelected, you can almost take it to the bank -- or to whatever is left of the banking system at that point -- that we'll get maxed out by the time he leaves office. GDP growth, fiscal 2015-2018 -- 4.2%, 3.5%, 3.4%, and 3.3%. The best we've seen in the past eleven years is 3.5%, one time. Real wage growth for workers covered by Social Security, fiscal 2014-2016 -- 4.0%, 4.3%, and 3.9%. That's after inflation. At first glance, the CBO's assumed unemployment rates look too high instead of too low. But I saw no indication that it took into account the millions of Americans who have given up looking for work under Obamanomics. Since the recession officially ended in June 2009, the over-16 civilian workforce has grown by less than 300,000, despite civilian population growth of 7.3 million. To be clear, I'm not claiming that the assumed items just identified aren't achievable. The right administration in Washington which on a relative basis leaves the American people alone and lets the country's businesses do what they do best could enable this to happen. But for the CBO to assume that they will happen paints a scenario which is too bright -- or, properly stated, insufficiently gloomy.